The driver of the Post newspaper, Toyota Haice courier van delivering newspapers to Eastern Province is believed to have been in deep sleep during the time of the accident due to fatigue. Sources told the Watchdog that there were two gentlemen on the Post Courier Toyota Haice bus. The driver had been working the whole day before leaving Lusaka yesterday morning. The survivor told the relatives the driver started dozing from as far back as Nyimba. “He forced his way until Petauke where he rested for about an hour. At the time of the accident the Post driver was in deep sleep and crossed over to the opposite lane at a very high speed”. Sources said the cause of the accident was driver fatigue due to over-working. The driver died on the spot, shredded to bits. The only passenger on the Haice survived with a broken leg and a laceration on his forehead. Police Spokesperson Elizabeth Kanjela confirmed to QFM News that the accident happened yesterday morning around 06:00 hours at Kafunka area along the Great East road. 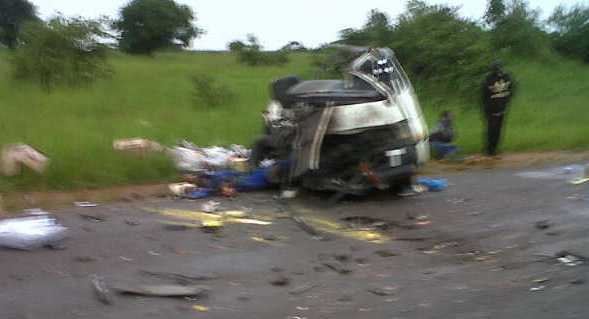 Ms Kanjela says the accident involved a Marcopolo Zambia- Malawi bus registration No. ABP 2994 driven by Chisenga Kalunga aged 35 of house No.104/32 of Makeni,Lusaka and a Toyota Haice mini bus registration No. ALC 8695 driven by Davis Ngandwe aged 32 of Garden house Lusaka who died on the spot. She explains that the accident happened when the driver of the mini bus lost control and hit into a Marcopolo bus due to excessive speed which was coming from Chipata heading to Lusaka. Ms Kanjela says all the injured are admitted to ST Francis hospital in Katete, while the body of the deceased is lying in ST Francis hospital mortuary in Katete awaiting postmortem.